It’s world cup fever, and the internets is no exception. Google’s got it, Twitter’s got it, and if you’ve got it you can surf the net to the sound of vuvuzelas. Like anything popular, it gets a huge amount of real-time Twitter action, but some disgruntled fans in Brazil started a hoax that took the world by surprise. Commentators of all sports routinely face criticism: whether they’re too enthusiastic, not enthusiastic enough, or have a one-word “special” vocabulary (looking at you, Mr. McAvaney). Carlos Eduardo dos Santos Galvão Bueno, more commonly known as Galvão Bueno, is a Brazilian soccer commentator who cops a lot of flak for his passionate calls. Wikipedia describes his style as “flashy, pointed with superlative adjectives, and … a large number of mistakes.” Exasperated during a World Cup match, one Brazilian fan tweeted “Cala Boca Galvao” – literally “Shut up, Galvão”. And then, as the cool kids say, it went viral. The phrase caught on, being retweeted and quoted over and over. Before long, “Cala Boca Galvao” was a trending topic, prompting hundreds of non-Brazilians to ask “What’s Cala Boca Galvao?” – which got the phrase trending even higher. And that, according to the New York Times, was the beginning of “one of history’s most successful cyberpranks”. Sure enough, enterprising Brazilians seized on the opportunity. “It’s an endangered Brazilian bird”, someone informatively tweeted. And soon there was an a flyer, a fake Twitter account and this brilliant Youtube clip. 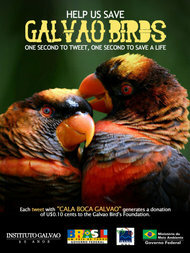 Tweet “Cala Boca Galvao”, the story went, and 10 cents will be donated to Save The Galvao Foundation. The newly created “Galvao” and “Galvao Bird” Wikipedia pages were very popular for a short time, before they were taken down by the watchful Wiki Police. Still not satisfied, and with “What’s Cala Boca Galvao” tweets still flying around, Brazilians came up with a new meaning. It’s Lady Gaga’s new single, they replied whenever someone asked. Sure enough, it wasn’t long before various fake video clips showed up on YouTube. This is the beauty of the internet – it can be a tremendous source of information, and a wonderful way of communicating with people all over the world. But all information, whether on the internet or elsewhere, needs to be treated with a due sense of scepticism. This is obviously a rarity for a hoax to be so well executed – the internet’s crowdsourcing nature generally enhances quality and accuracy. Perhaps the risk of being duped is the price we pay for listening in on other people’s conversations. Parrot adoption is very much like baby adoption. Those who have parrots they cannot care for offer them to people who want a parrot. The adoptive parrot owners may not be able to afford the initial outlay, or they may simply want to give a good home to a parrot that must be relocated.